Apples consist of app. 85% of water under their crispy skin. They only contain small amounts of proteins and fat, but are rich in nutritional substances that strengthen the immune system, heart and circulation and clean the intestine. App. 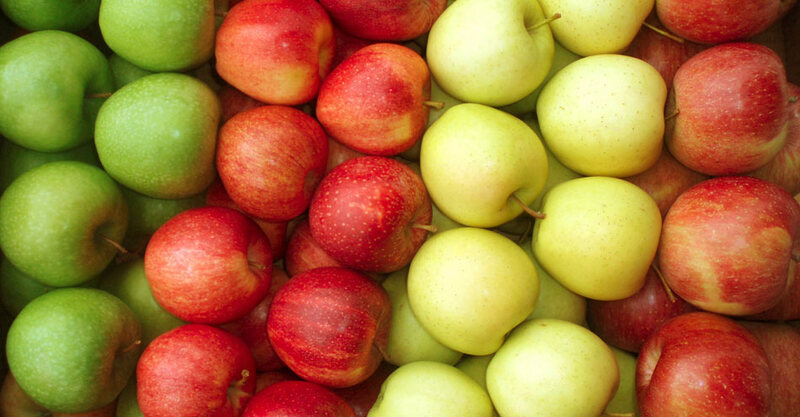 12 g Thanks to the favourable ratio between fructose and glucose apples are also well-tolerated by diabetics. Up to 2.3 g for both pectin and cellulose. These are important dietary fibres that do not only help digesting. Pectin also favours the removal of toxic substances and lowers the cholesterol level. Between 5 and 35 mg Vitamin C is mainly contained in the skin of the apples. We therefore suggest that it shouldn’t be removed but be enjoyed instead. About 0.5 mg per 100 g of apples. This corresponds to about 5% of the daily requirements of these vitamins. Furthermore, apples contain all B-group vitamins. Apples contain from 100 to 180 mg of potassium and other important mineral substances such as iodine, phoshor, calcium, boron, fluorine, magnesium and iron.